oh the pain…. – Are Your Planets Keeping You Fat? Home › My Journey › oh the pain…. The atmosphere at the start was amazing. Up at the start line, discarded jumpers and jackets lined the streets for charity collection. The thousands of us in C group patiently waited for our signal to go. 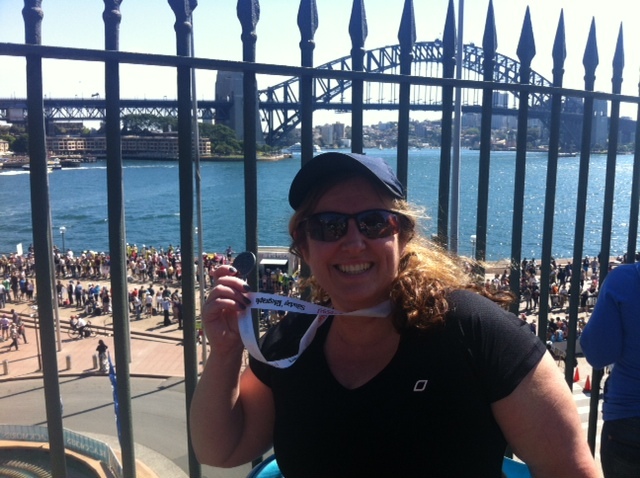 A great big well done has to be sent to the organisers of this years Sydney Running Festival. Despite the 34 odd thousand entrants, things were supremely stream-lined. How did I go? The best that can be said is that I finished. 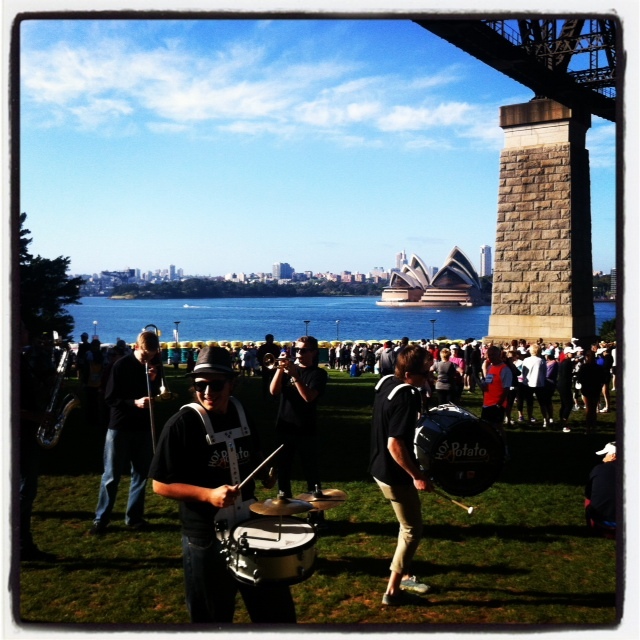 A few kilometres into the 9kms of the Bridge Run, I had my doubts about doing so. Finishing, that is. That left ankle I’ve had problems with over the past couple of weeks seized up at about the 2k mark. At that point walking on it was painful- running was almost impossible. At the 4k mark the blisters (remember I told you about them?) I acquired the training day that I hurt my ankle re-asserted their presence. I seriously considered abandoning at that point and popping across to a coffee shop in Macquarie Street. It’s that kind of talk that constantly brings me undone. “Why are you even trying?” “Look around, you’re the fattest person here.” “Why are you whingeing about your pain, it’s not as if you’re running the marathon.” Astrologically, I know that’s Saturn sitting on my shoulder. Rationally, I know I need to learn to deal with that. The truth is for whatever reason over winter, my training wasn’t as consistent as I would have liked. More importantly, I didn’t lose the weight that I wanted to lose before attempting it. More than anything, that’s what’s killing my ankles…and my knees…and my shins. As I’ve said before in this blog, I rarely keep commitments to myself because part of me truly doesn’t think I’m worth keep commitments to. That’s Saturn as well. I can either choose to listen and allow it to hold me back, or press forward. Somehow I have to learn to do the latter. Even yesterday, if it wasn’t for the fact that my BMF was going to be running his marathon and I would have to confess to him that I hadn’t finished, I’m not sure I would have kept going. My husband argues that I’m stronger at the core than I think I am. My friends are all praising me for finishing, yet I feel like a fraud. I feel like I should have just announced that I was going to walk it- perhaps I wouldn’t now be in this pain. I guess though, at the end of the day, I did- keep going, that is. I didn’t get the result that I wanted, but in truth, I probably got the result I deserved. Time to draw a line under it and keep going. I think it’s great you did it at all – no matter if you ran or walked it. I walked a 10km thing a couple of years ago and it really exacerbated my hip. I didn’t expect an injury from WALKING!?!?! And I completely understand the importance of committing to something (yourself) and sticking to it! Thanks Deb. It’s a tough one & your right, the achievement is in finishing…I just can’t quite feel that yet. A day in the life…with a bit of shuffle… | Are Your Planets Keeping You Fat? letting go and growing up…. | Are Your Planets Keeping You Fat?